JOHANNESBURG, South Africa, October 7, 2015 (ENS) – “When people complain that they are stuck in traffic, we tell them that they are, in fact, the traffic,” Johannesburg Mayor Parks Tau said in Sandton on Sunday. 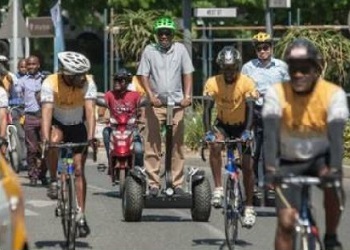 Mayor Tau was speaking at the start of the “Streets Alive – Jozi W-R-1” parade and fair that set the tone for the month-long EcoMobility World Festival, which officially kicked off on Monday after months of planning. On Sunday, Johannesburg residents reclaimed their streets from vehicles and changed the way they navigated the wealthy urban district of Sandton. A festival atmosphere featured jugglers on unicycles, choristers from Alexandra, police officers on horseback, marimba players, BMX tricksters, mime artists, face painters, breakdancers, electric bike riders and Geza Jozi waste reclaimers. The celebration attracted hundreds of residents. Mayor Tau said the Ecomobility World Festival serves as an introduction to the new future of mobility and transport in Johannesburg. “For our economy to grow and flourish, we need to decongest our roads and have fewer people spending time in their cars stuck in traffic. That is why the city, supported by the national and provincial government, is investing in transport infrastructure such as bridges, cycling lanes and spaces for pedestrians,” said the mayor. He then stepped onto his Segway, the two-wheeled, self-balancing, battery-powered vehicle that he will use during the festival. Riding next to him at the front of the procession on their way to Alexandra was Gauteng Premier David Makhura. Premier Makhura said he would, for the duration of the festival, use Gautrain and Rea Vaya bus rapid transit system to commute to and from work. Yeom Tae-Young, the Mayor of Suwon, the Korean city that hosted the inaugural EcoMobility World Festival two years ago, said he hoped Johannesburg would achieve social integration the way the Koreans did. Transport Minister Dipuo Peters said ecomobility is not only easy on the wallet but also makes for cleaner air and healthier lungs. “I think it was a really good day. People came out, which was what we wanted,” said Mohammad Suleman, co-organizer of the Streets Alive Parade and of the Freedom Ride on October 11. The City of Johannesburg and ICLEI selected the Sandton district of Johannesburg to be an EcoMobile neighborhood for the month of October because it is the most prominent financial district in Africa, home to the JSE Securities Exchange and most of the country’s major banks. Sandton is often referred to as “Africa’s Richest Square Mile. Sandton is growing into a major public transport hub with a Gautrain station, and a destination for the current expansion of the Rea Vaya Bus Rapid Transit System. A new bridge across the M2 highway will link Sandton with the adjacent area of Alexandra providing access for an estimated 10,000 pedestrians and cyclists every day. During the Ecomobility Festival, residents will still be able to use a private vehicle to get to work, however, motorists are encouraged to change the way they move and use public transport, walk or cycle. Member of the Mayoral Committee for Transport Councillor Christine Walters, who chaired the Clean Bus Fleet workshop at the Industrial Development Corporation in Sandton said the City has received positive feedback from members of the public, the media and delegates. Walters said Mayor Tau wants to introduce the next phase of the BRT system by 2018 once the Fleet Greening Programme, through which buses will be converted into eco-friendly vehicles, is launched. Elephant grass will be grown on a large scale to produce biogas and create jobs.